YOUNG HARRIS, Ga. - Dec. 3, 2018 - PRLog -- Just released! 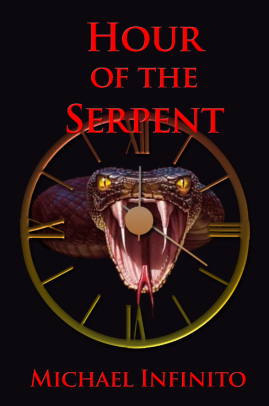 Hour of the Serpent by Michael Infinito! Michael Infinito has been hailed as the next Stephen King! A novelist and short story writer, Michael Infinito grew up in New Jersey but now resides under the clear blue skies of eastern North Carolina. With a life-long passion for literary arts, his goal has always been to create compelling stories that people won't want to put down. XXXtreme Discretion (2015), A Wish to Die For (2015), The Hanging Tree (2016), The Colby Ghost (2017) and Hour of the Serpent (2018) are published by Black Opal Books (https://blackopalbooks.com/), with more to come. Represented by Loiacono Literary Agency (https://loiaconoliteraryagency.com).